I have been in a bit of a rut lately when it comes to my photography. Not sure why. Kind of the same feeling I had when sitting down to write papers in University. You get this block in your head and are not sure where to start. Some of the photography blogs that I read regularly suggest getting out of your comfort zone and shoot something different to get out of these ruts. I believe that I like nature photography because my subjects don't judge me. I feel comfortable knowing I am alone with nature and I can take all the time that I need to find shots that catch my eye. This past weekend I took a baby step in getting out of my comfort zone. 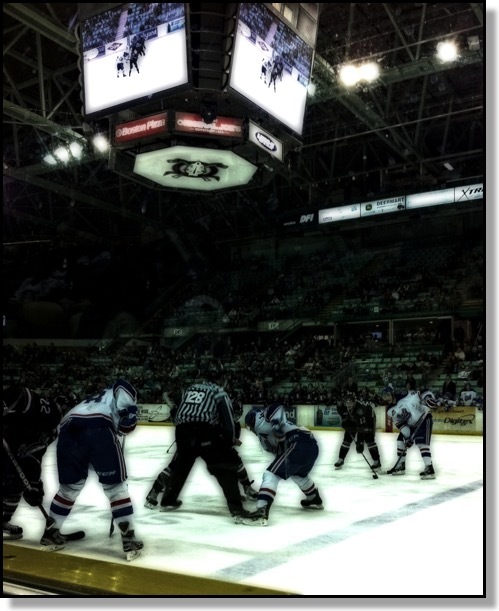 I went to a Western Hockey League hockey game and took some photos. Now, when I say baby steps what I mean is that I didn't take my "big" camera but instead pulled out my iPhone. No big lenses, no wondering which settings to use and not worrying what people might think I was doing. I actually had fun! This maybe the power I needed to get out of my rut. 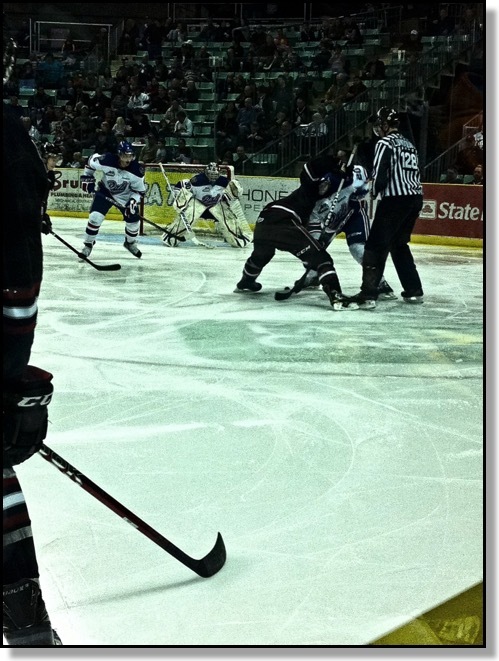 I had pretty awesome seats to the Red Deer Rebels game. Front row right up against the glass. They were playing the Regina Pats. Our home team Rebels (Team in Black) won the game 2-1. These are a couple of shots from that game. This was taken the same night as the previous image. 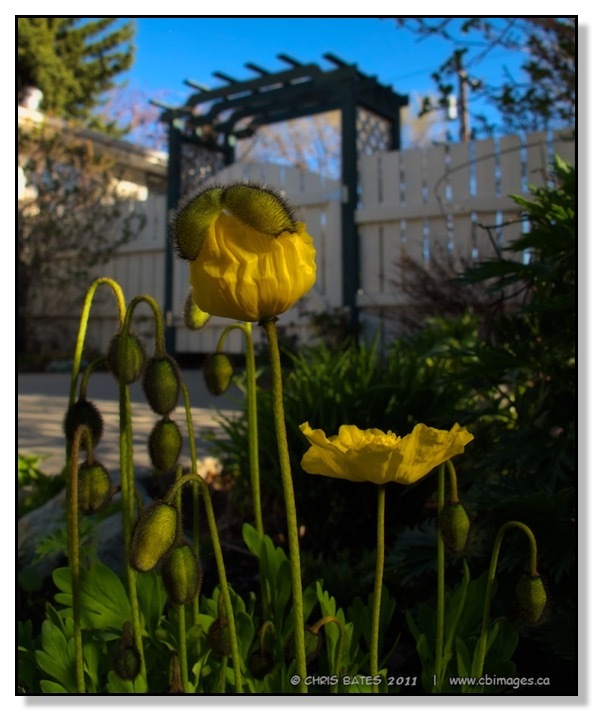 This is facing west at the Red Deer City Hall gardens. In the summer it is quite the sight with roses and perennials. 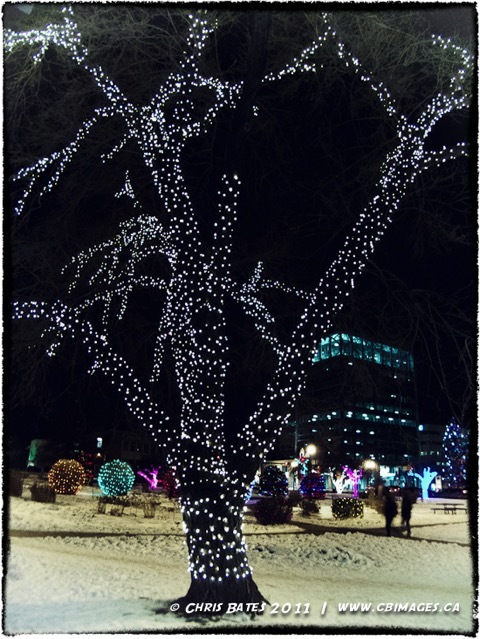 In the winter, the city covers the trees, bushes and shrubs with lights. People are always strolling the pathways to get a closer look. I love Christmas! The colour and and lights warm up our extraordinary cold and dark winters. 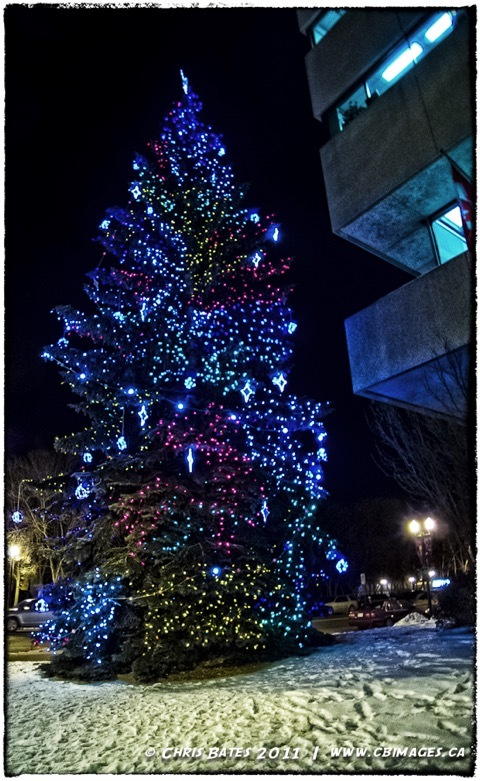 This was taken last night in downtown Red Deer with a simple pocket camera. The city decorates the City Hall Park and this rather large Christmas tree. Fall is here. Time to put the outdoor gear away for winter hibernation. 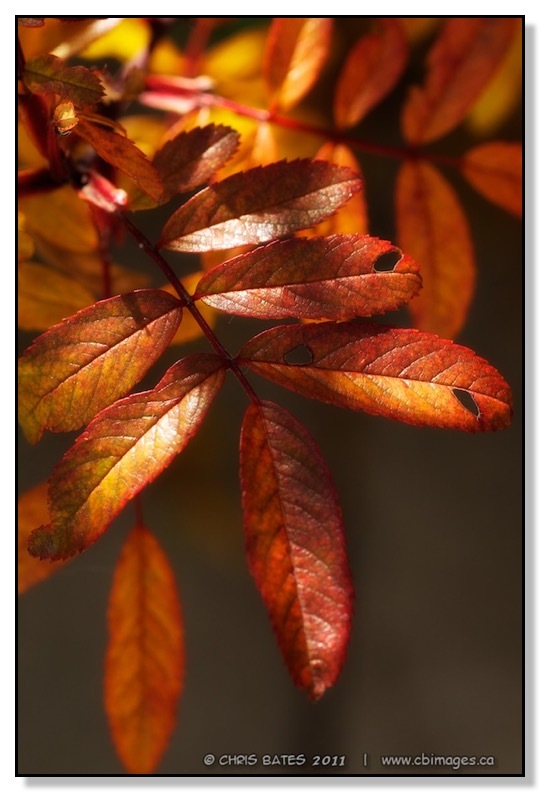 This is a picture of rose leaves from our backyard garden. These add the traditional fall colours to our garden. Red, orange and yellow. We purchased a new bird feeder for the backyard. One of the disadvantages of this new feeder is that the squirrels can get into it. The advantage is that we are attracting many new birds to our backyard. 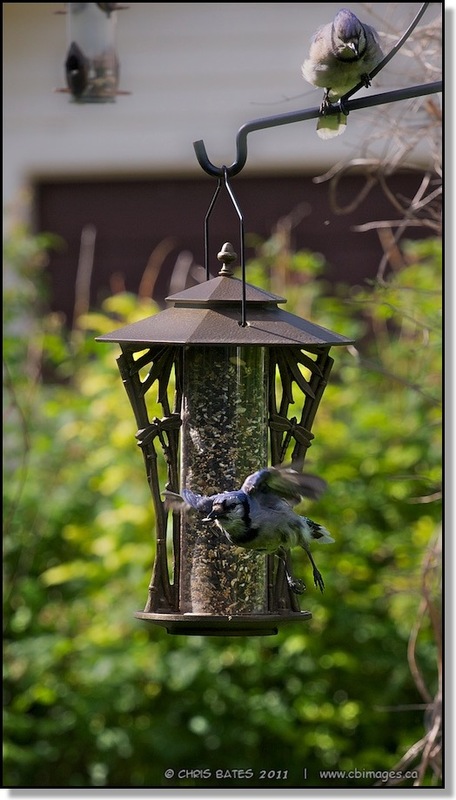 I have seen nuthatches, blue jays, chickadees, sparrows, crows, and magpies all eat out of this feeder since it can store seed and nuts. The tube feeders that we have in place just attract the smaller birds such as the house sparrow, chickadee and finches because it can only hold small seed. I took this photo of the squirrel eagerly waiting for me to leave after I had just refilled the feeder. He was even coaxing me to leave with his non-stop chatter! 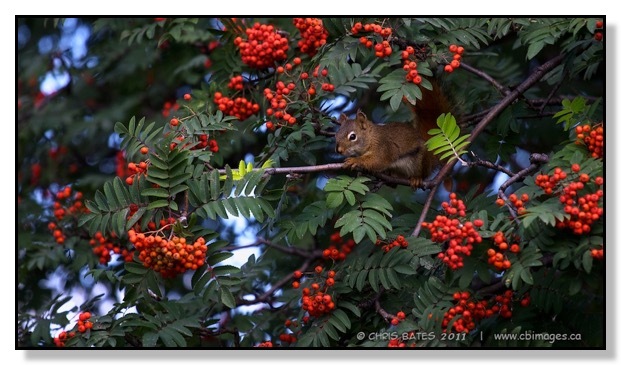 I left after I got this shot in the berry abundant mountain ash tree. 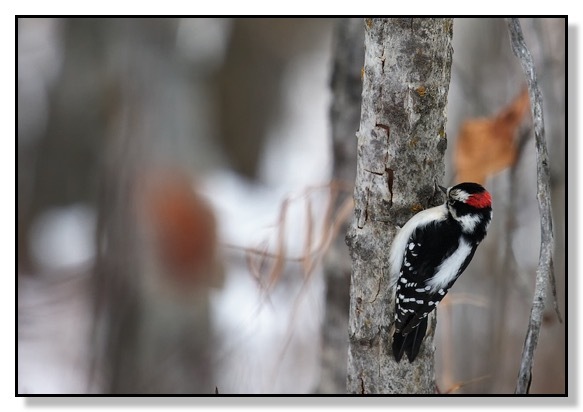 Another Alberta Blogger, Kathleen Moors, has squirrels visiting her feeder but noticed that she had a woodpecker come visit. She asked if she could use one of my photos that I have used here. I would like to thank her for sharing. Check out her site as she is a wonderful painter. I find the best time to take photos of our garden flowers is early morning or late evening just as the sun is rising or falling. The problem with living in the northern climate of Red Deer, Alberta is the sun rises in the summer as early as 4:30AM and sets as late as 11:00PM. So, you have to be an early riser or a night owl. 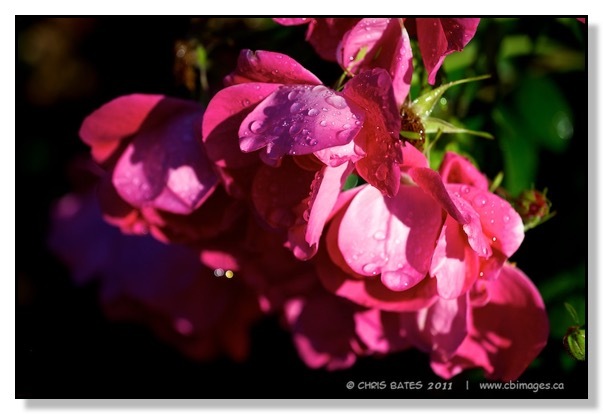 I was up early enough to capture this shot of one of our rose bushes after a early morning rain with my Canon EF 70-200mm f/4L. 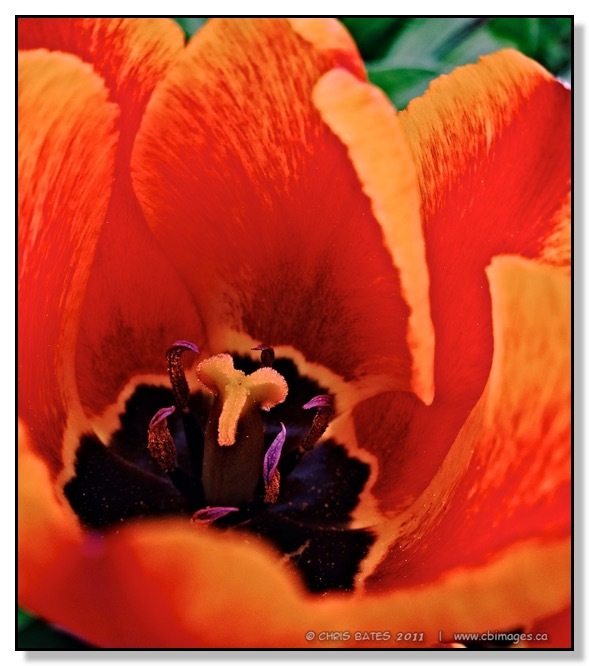 I bought this lens for bird/wildlife photography but I am finding it well suited for close up floral shots as well. 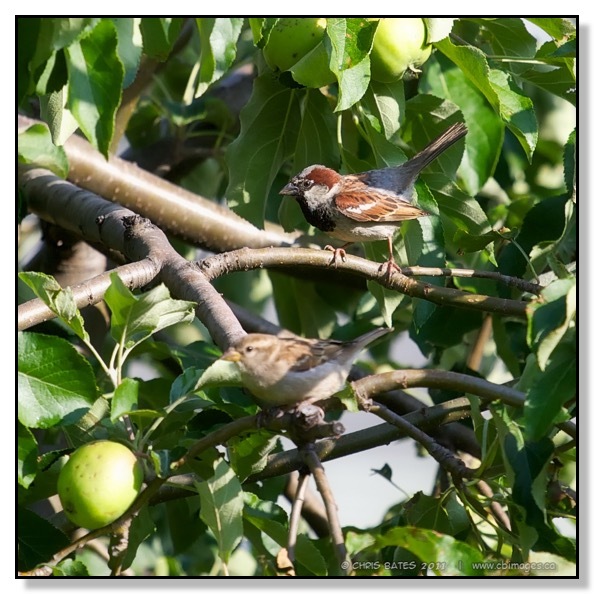 House Sparrows love our neighbourhood. They love the trees and the food everyone leaves out for them. Watching them over the years you get used to their quirky behaviour. Once and awhile you will notice a male showing off to a female by keeping his chest low, wings down, and tail up going into some sort of dance that resembles an epileptic seizure. When I see it, I tell my wife the sparrows are "chicken dancing." The camera doesn't quite capture it. I will have to carry my little Kodak Playsport around with me more often to try to capture video. Things have been a little crazy at work so my photography hobby has taken a bit of a back seat. I feel like a bee. Always moving and feeling like my work is never done. 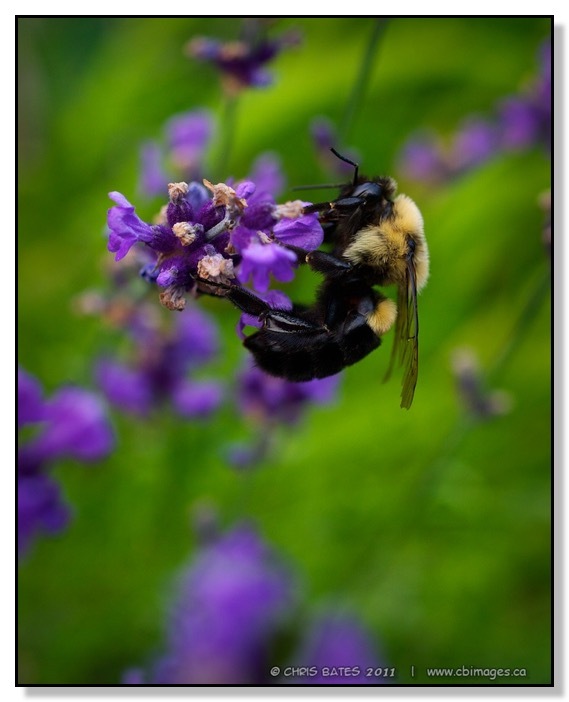 This was shot with my 35mm macro lens in my parent's backyard a few weeks ago. 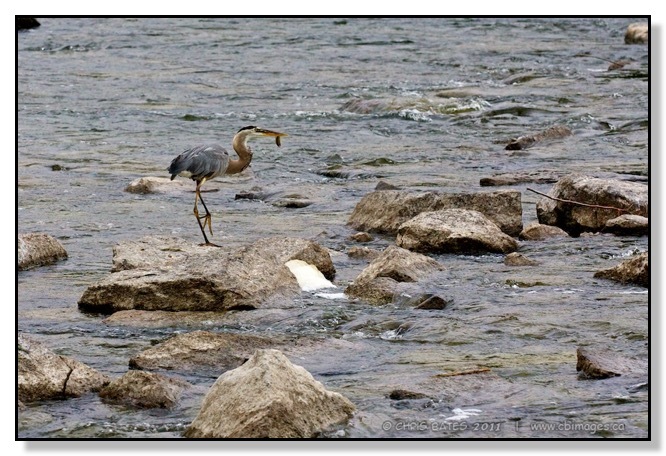 This is another shot I took while visiting family near Peterborough, Ontario. 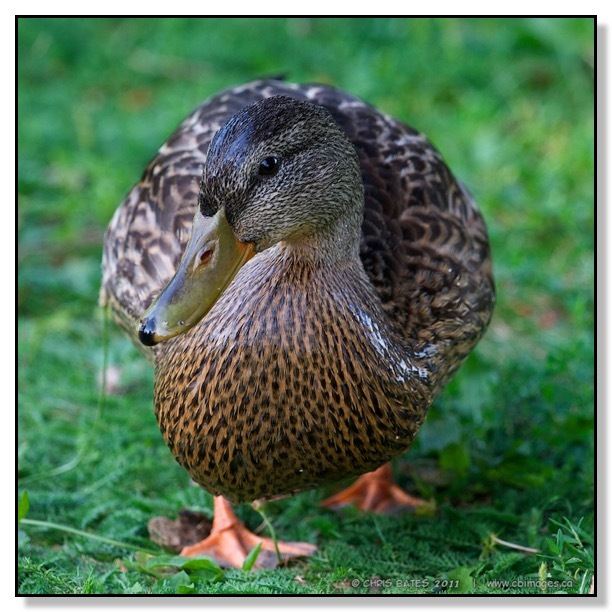 The ducks along the river banks of Peterborough are known for being pretty tame and not really afraid of people. I did not bring my tripod. I was lucky to get a fairly sharp image while hand holding the camera at the 140mm focal length using a slow shutter speed of 1/60th of a second. Just returned from a trip from Ontario visiting family. My father and brother in law (who was visiting from South Africa) decided to go fishing at Youngs Point one night after supper. I went along with my camera. 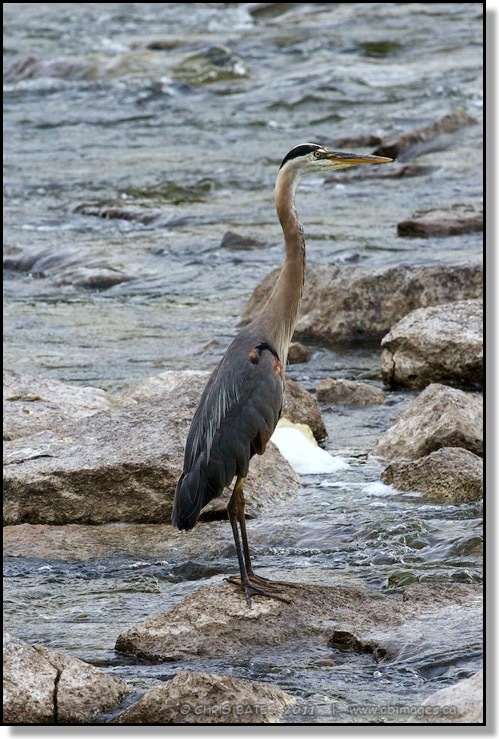 Dad called me over to his fishing spot and told me that I had to check out the Great Blue Heron standing at the bottom of the dam. 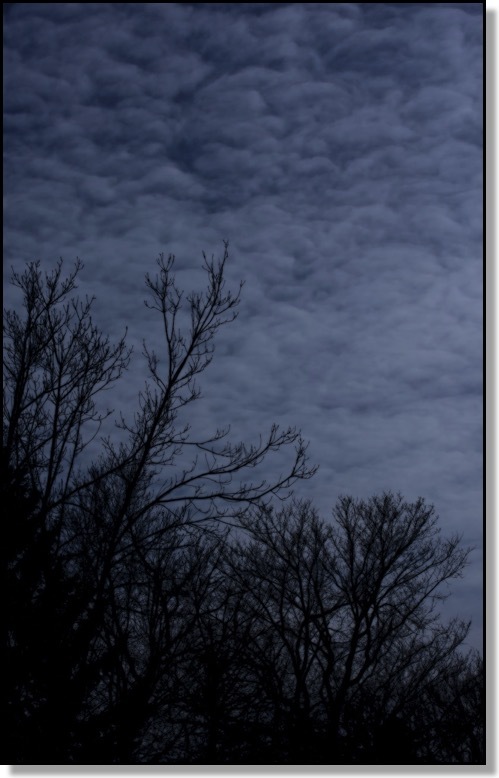 It was close to sunset so I had to set my ISO to 800 in order to get a fast shutter speed while using my telephoto lens. 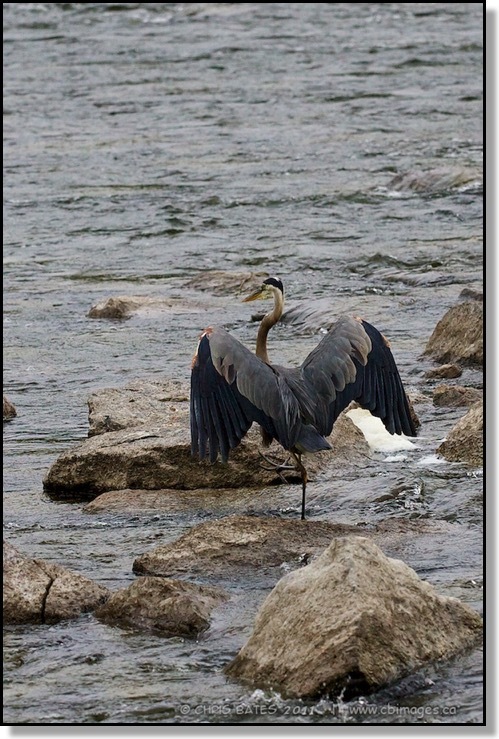 Dad and my brother in law never caught a fish that night but while watching the Heron he had caught two. Looks like he had the better fishing spot picked out! I have placed Nyger seed feeder sacs in our crab apple tree in hopes of luring goldfinches. When I noticed these birds enjoying the seed I thought I finally attracted female goldfinches. 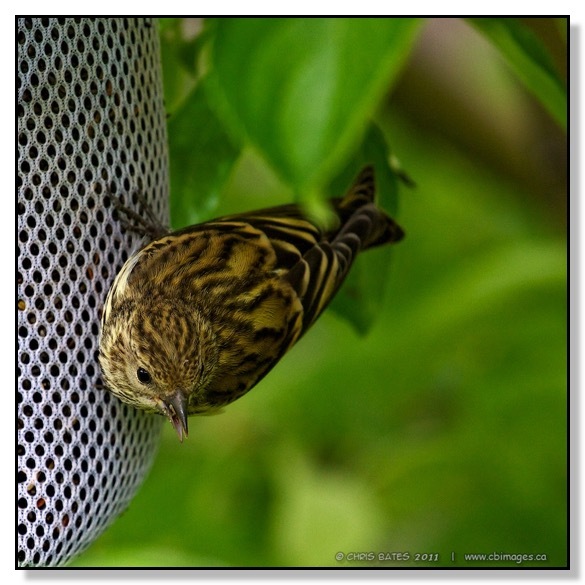 Turns out this is a Pine Siskin. They seem to be getting used to me as I was able to get quite close to them without scaring them off. We have had plenty of rain the last 2 weeks. Our plants are loving it especially when the burst of heat comes. 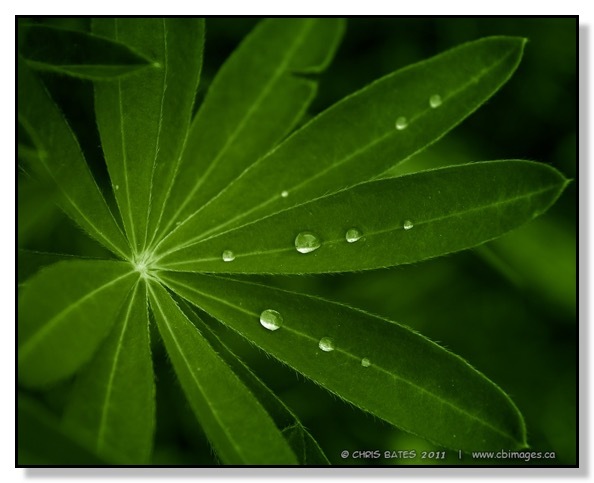 This is leaves of a lupine waiting for the suns rays. 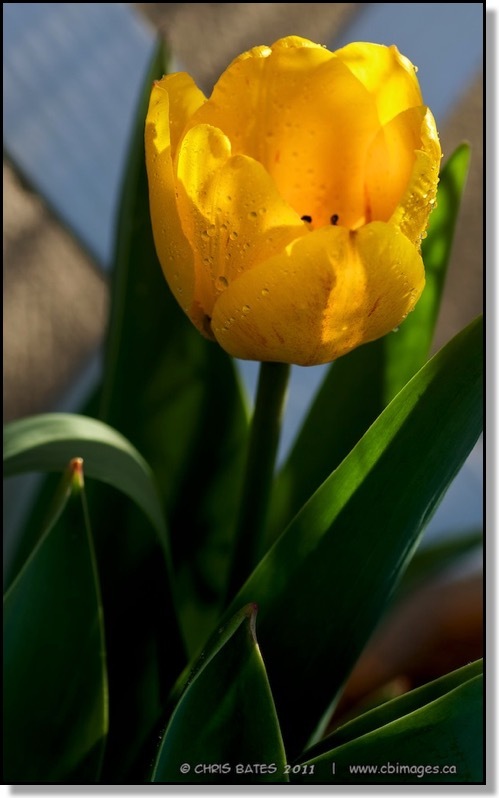 The tulips have pretty much come and gone from our garden. Everything is a little late this year so most of our perennials are coming up at the same time. Can't keep up with the picture taking! This was taken with a point and shoot camera. Looks like six "snakes" surrounding a single "charmer". Our poppies are starting to bloom. As you can see by this image there are plenty of "heads" that will flower on this plant. The last couple of years the house sparrows have been eating them so there hasn't been as many flowers. This year should be different. I went for a short walk from the house on Friday morning to the Kerry Wood Nature Centre. It is nice in a way that I can walk 10 minutes east and hit downtown Red Deer and 10 minutes north I can hit a nature sanctuary and feel as though I have left the city. I moved to Alberta more than 15 years ago from Ontario, Canada. 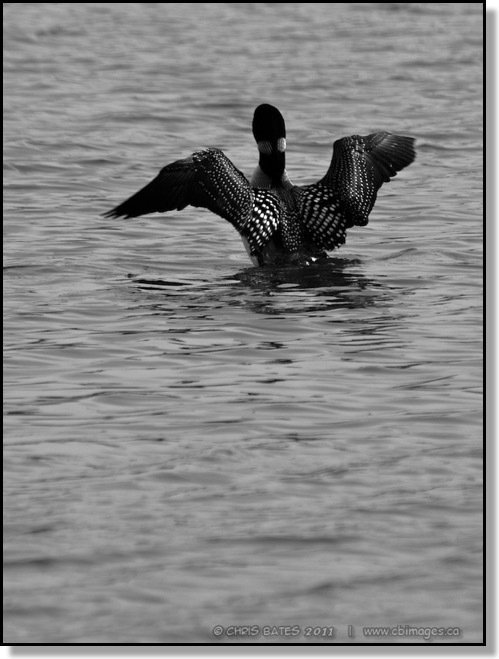 I spent most of my teenage/early adult life in "Cottage Country" where the loon is a common sight. The call of the loon is eerie and at the same time comforting. I was happy to see four Common Loons playing and calling to each other during my walk on the shores of the Gaetz Lakes in the Nature Centre. It was like I had walked home! I was lucky enough to capture this one showing off. The weather is getting warmer now. The perennials are coming out of the ground. Despite all the snow we have gotten this winter the ground is starting to get dry due to the lack of rain. I had just watered the beds this morning and taken this picture after the morning chore. As mentioned yesterday we have a white version of the same flower posted previously. 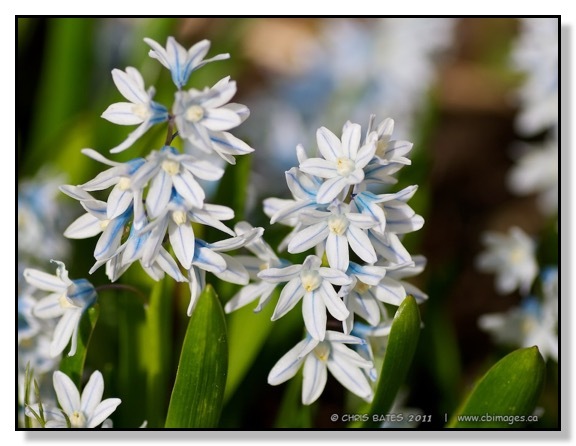 These white flowers with a blue strip are much more abundant in the flower bed under our crab apple tree. This was shot using a dedicated Macro Lens. Spring is finally here! 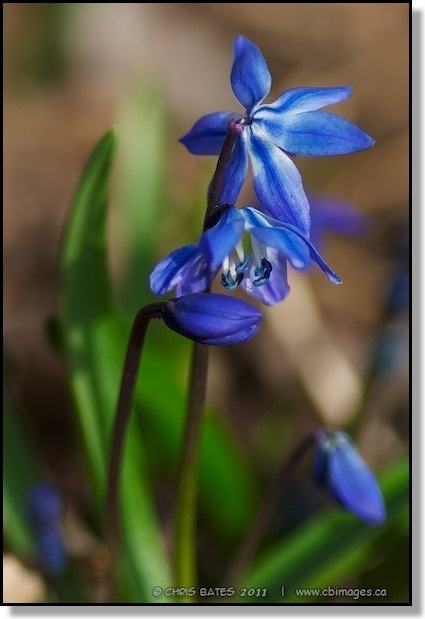 These are the first of the flowers from our gardens to bloom from the long hard winter. Not sure what these flowers are called. They are very tiny and come in blue or white. I took some pictures of the white flowers but since the last few images contained a lot of white snow thought I would stick to some colour! Still lots of snow on the ground and on the roof of our house. The daylight sun is trying it's best to warm things up but it has a long way to go. 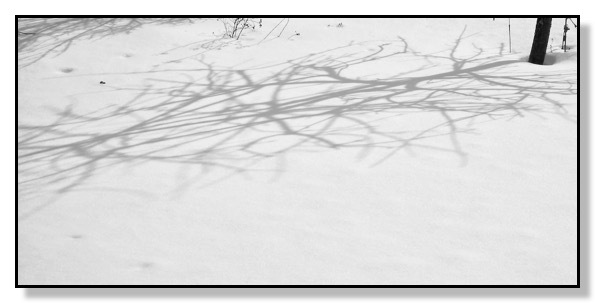 Click here to see the amount of snow we have at the end of March. 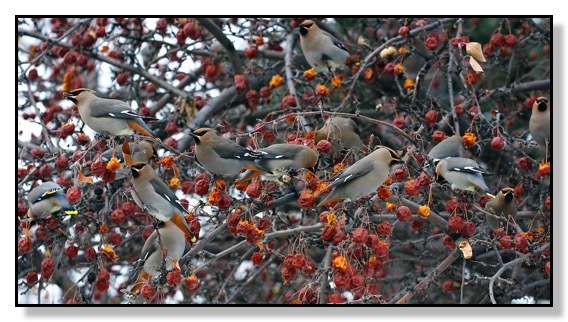 On my way home from work today I noticed the neighbour's crab apple tree was covered with a blanket of Waxwings. I finished my drive home, parked the car in the garage, ran into the house, said hello to my wife, headed downstairs to grab the camera, said I will be back to my wife and then walked to the end of the alley to get some pics of the birds and tree. I was able to get quite close to these birds. 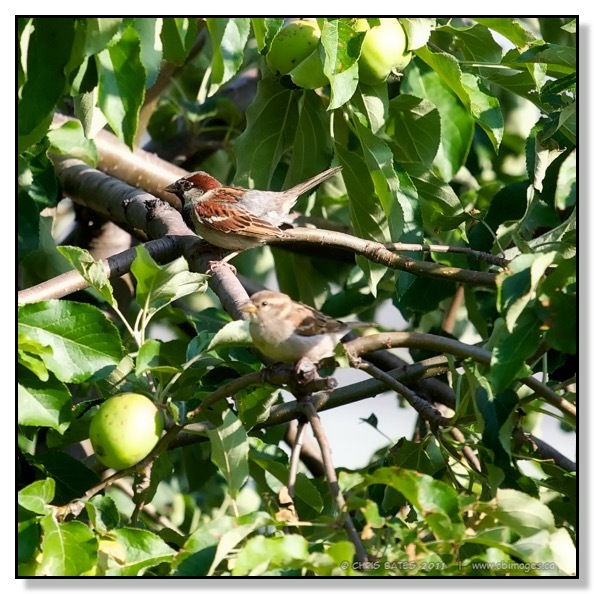 A passerby by said to me that he heard the birds get a little intoxicated by the fermented apples so maybe that is why they are not as skitish as usual. Click here to see a larger version of this picture. I am hoping the old weather saying "in like a lion, out like a lion" rings true. The first half of March has seen extreme cold. So if the saying is true then we hopeflly can expect nice pleasant weather. However, checking things out on Wikipedia this saying doesn't hold any water. This is a picture of our Maverick. It's the closest image I have of a fericious lion. Although he probably shares more similarities to a lamb. Still very cold here. My brain is in a freeze. I decided I needed to try to get out of my creative hibernation and point the camera upwards. This shot was taken around noon today. As you can see by the long shadows the sun is still low in the southern horizon. It is abnormally cold for February. This is the time of year I trim the branches of our apple trees. 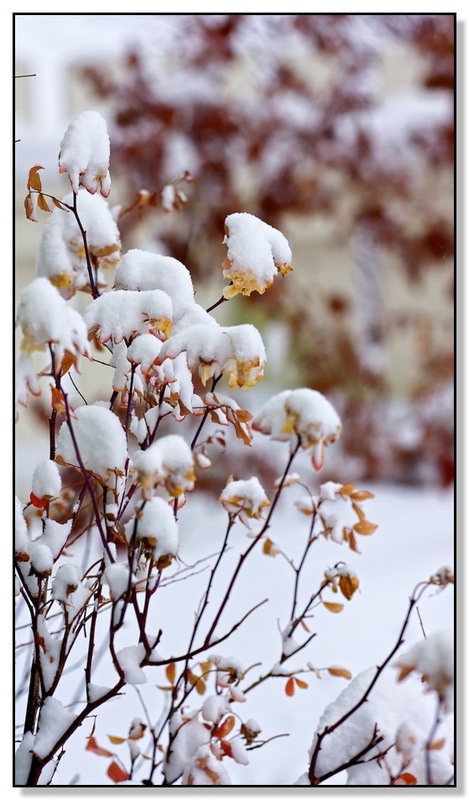 However, with the windchills in the -30 to -40 Celcius range I have not had the ambition to go out and prune. Stepped out of the house last weekend and was surprised to see a large flock of waxwings had come to visit the neighbour's berry laden mountain ash tree. The tree branches out over our crab apple tree. I rushed back inside and grabbed my camera which had a short telephoto on it. 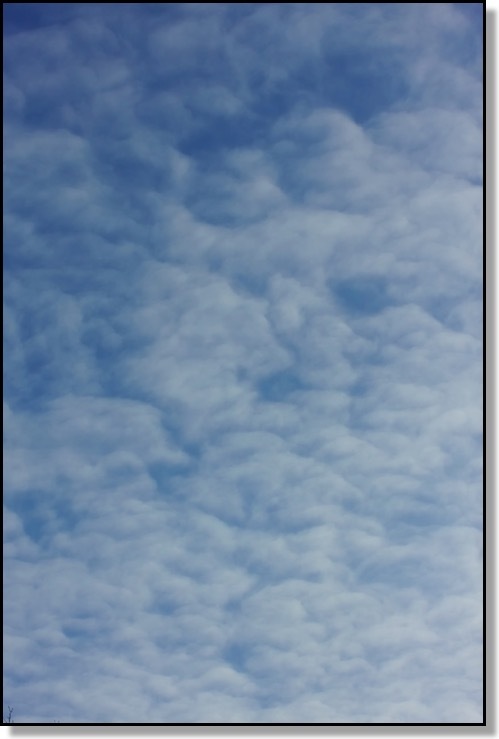 I took some shots from just outside the back door of the house and then proceeded to walk slowly towards the birds hoping to get some "up close shots." 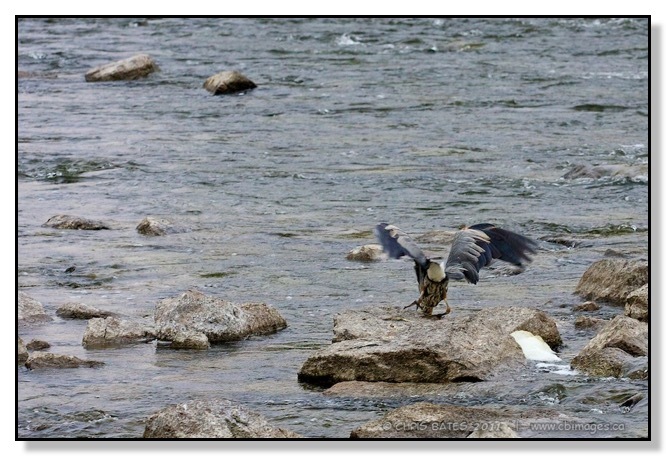 From my past encounters with these birds I found them to be very skittish. But this time I was able to get fairly close. They must have been hungry. The video is from a few weeks ago. These same type of birds had visited the trees a street over. They fly in huge flocks in search of food. 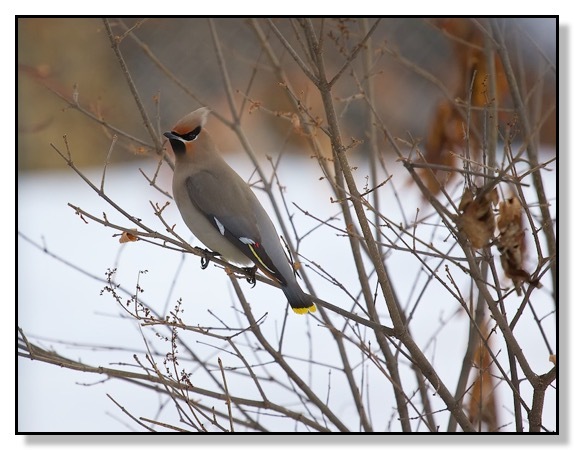 The neighbourhood fills with the sounds of these beautiful birds and is a sight to see. Canadian winters do have its charms. It is very cold again and because of this I am not getting outside as much to snap pictures. Our cats are strictly the indoor type and even they are noticing the house is cooler than usual. Here our youngest cat (About 6-7 months old) has discovered that after you take the clothes out of the dryer it is a pretty comfortable place to sit. 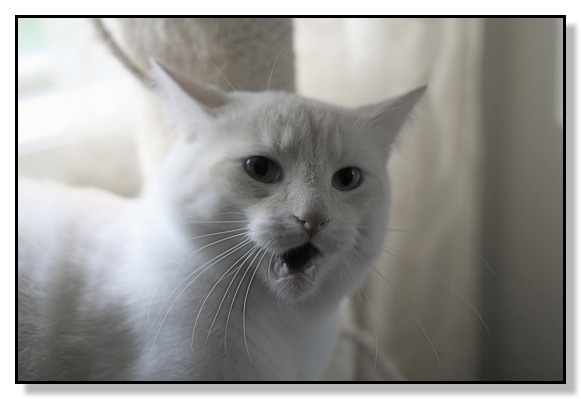 Either that or he really likes the smell of our fabric softener (Green Meadows). Instead of the dreaded red eye I got some funky green eye. My wife urged me to come in a hurry to snap the picture and I did not have time to find and install the flash soft box. I also had to point the flash at the cat because if I pointed it upwards to bounce off the ceiling the light would not reach inside the dryer. 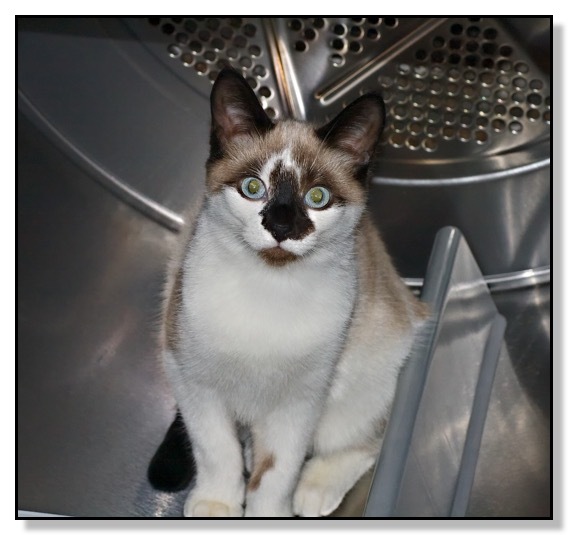 A couple of days later all three cats were in the dryer together but I was not able to get to the camera in time. I might have to wear my camera 24/7. Some visitors did not like my last post. It was sad but that is how nature works. I had no hand in but just document what I see. 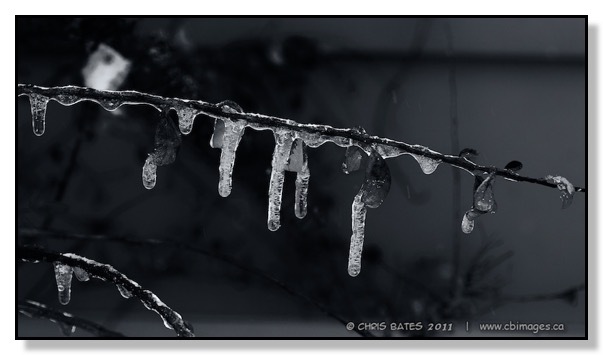 This is not a winter image but needed to show that with the bad comes good. 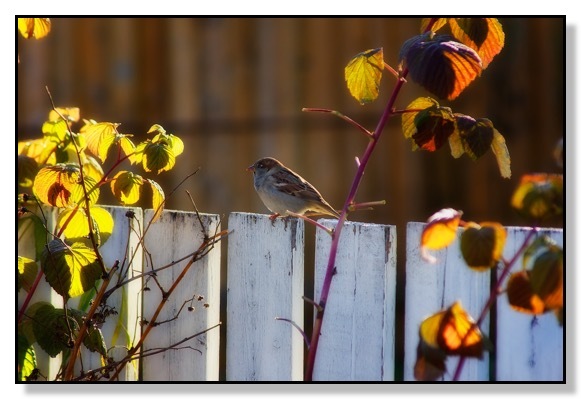 This is a lone house sparrow visting our backyard and the remaining raspberries and enjoying the warmth of a fall sunset. It has been cold here the last week. Minus 20 Celcius weather. 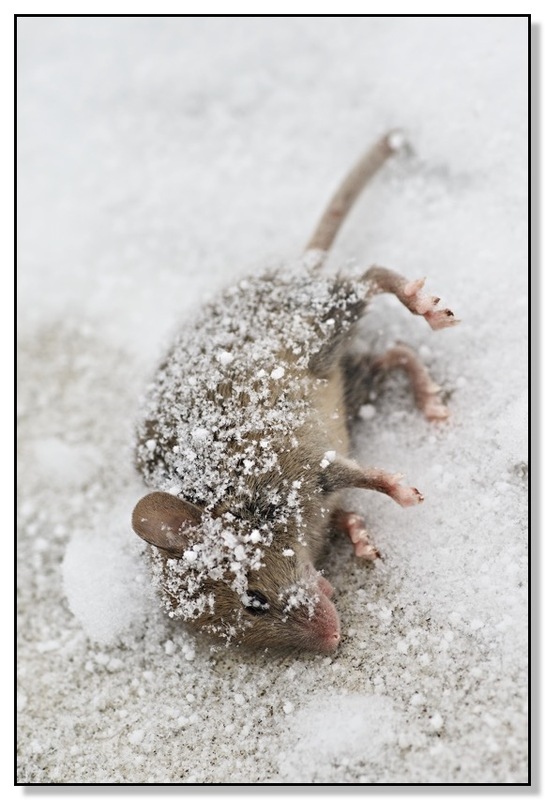 I went outside to take pictures of the snow covered fences and vegetation this morning and I noticed this poor little guy on our sidewalk. There has been so much snow that we have been shovelling at least once a day. We might have buried the way to his home or his food source. High winds this past weekend packed the new fallen snow down to make it pretty hard. This is the roof of our garage and it looks like the virginia creeper is holding the snow from sliding off the roof. 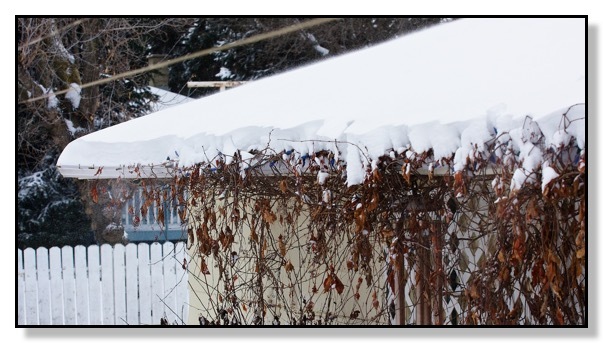 Click on the image to see a larger one and you can actually see the wind moving the snow on the roof and under the eaves. PS: I finally got listed at coolphotoblogs.com. Please vote for my photo blog if you like what you see at the links below. A winter storm is upon us. The snow shovel has gotten a work out. This is our roses along the back wall of our house. The high winds have not taken the snow off them. Went for a walk at the Kerry Wood Nature Centre yesterday while the weather was still relatively warm (Just below 0 degrees ceclius). This was the only bird I could get close enough to photograph during my hike but I could hear chickadees and waxwings playing in the woods. My lens just couldn't reach far enough to catch them. This Downy Woodpecker was busy searching for food. He must sense the winter storm the weather people are predicting for this weekend.